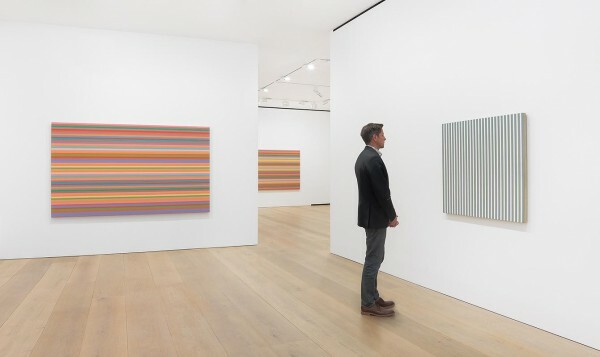 Bridget Riley,The Stripe Paintings 1961 – 2014, installation view, David Zwirner, London. 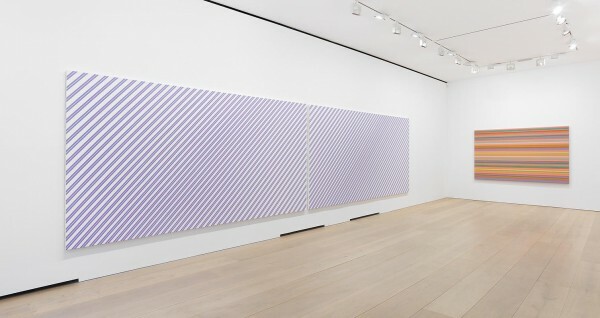 Image courtesy David Zwirner, © the artist. 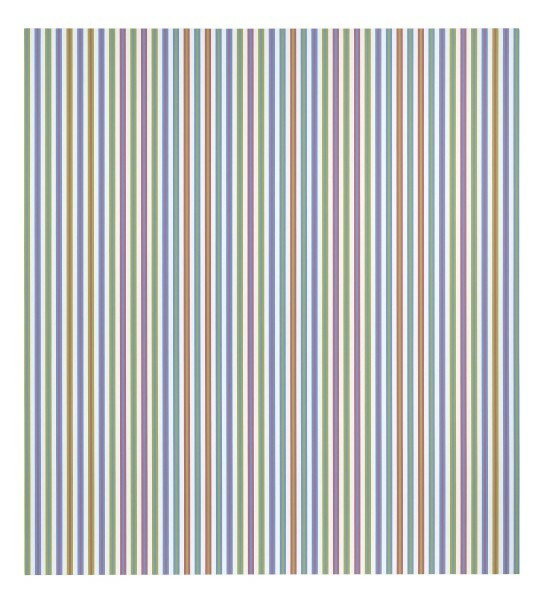 Bridget Riley, Elysium, 2003/1973, acrylic on linen, 261 x 236cm. Image courtesy David Zwirner, © the artist. This sparkling summer’s day, I want to send you to Mayfair to see one of the most glorious shows of the year. 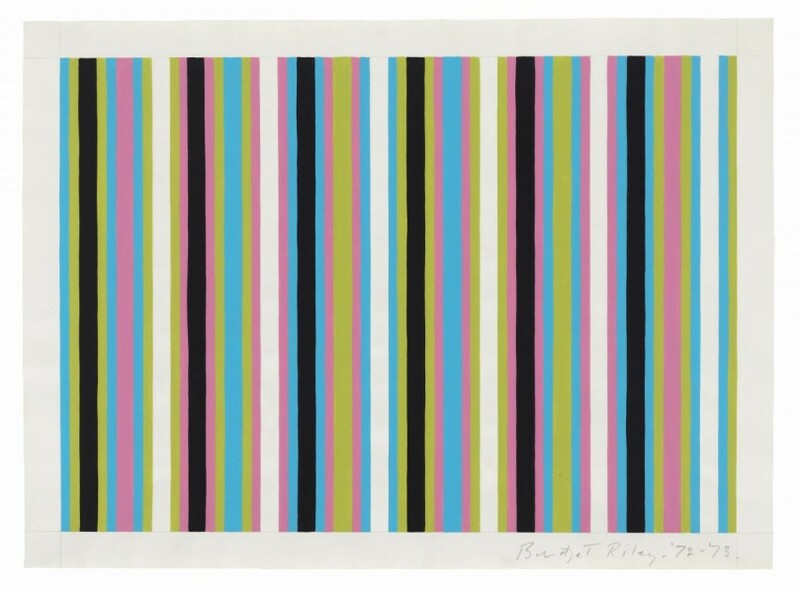 In a new collaboration between David Zwirner and Karsten Schubert, Bridget Riley is showing a group of 15 stripe paintings and a small collection of studies on paper. Drawing on works from 1961 to 2014, the artist’s meticulous enquiry into the interaction of form and colour across five decades is breathtaking, not least for its rigour and commitment. In diagonal, horizontal and vertical form, colours modulate, pulse and flicker, with metronome precision; these are paintings that demand energetic looking and reward us with a profound sense of pleasure that is both optical and emotional. Be aware too that this show is hung by the artist, this is how she wishes you to experience the work, and give yourself over to the physical sensations generated by the canvases she has selected to hang together on each of the three floors of the galIery. If you haven’t already, then take the opportunity to see the phenomenal Matisse Cut-Outs exhibition at Tate Modern this season, while Bridget Riley’s show is still fresh in your mind: these are artists who are strands on the same DNA double helix, and we are more than fortunate to have the chance to view both, in depth here in London this summer. No more words from me this week. This shows speaks for itself.